SpaItalia, a Belgian celebration of Italian style, this year honoured one of the most prestigious Italian car companies Maserati, while at the same time recalling the 50th anniversary of its famous Formula 1 title with Juan Manuel Fangio, and paying homage to the marque's founder Alfieri Maserati. Last weekend basking in glorious Ardennes weather SpaItalia attracted one of the finest displays of Maserati’s seen in Europe recently as Trident owners' congregated on the Grand Prix track while a special tribute was paid to the 250F, the best known of the Trident's Formula One cars. Alfieri Maserati is born in 1887, just 120 years ago. On December 14, 1914 he created in Bologna his own firm with his brothers Ettore, Enersto and later Bindo, the “Societa Anonima Officine Alfieri Maserati”. During these first years of activities the objective was mainly to adapt engines on Isotta Fraschini chassis. The first car they were wholly responsible for was the Tipo 26, built in 1926. The engine was an 8-cylinder in line with a 1.5 litre supercharged displacement that developed 120 bhp at 5300 rpm. Above the radiator a then unknown badge presented a trident that evoked Bologna's famous statue of Neptune. The Tipo 26 made its debut with Alfieri Maserati at the wheel and Guerino Bertocchi as mechanic in the Targa Florio on April 25 1926. It came first in its class, ninth overall. Since then the name Maserati has been always associated with motor racing as it was confirmed last July in Francorchamps when the Maserati MC12 won for the second time the famous 24 hours for GT cars. Maria Teresa de Filippis, the first woman in the automobile sport history to drive a Formula 1 car during a Grand Prix and a figure synonymous with the Maserati marque, was present during the SpaItalia weekend. Last weekend in glorious Ardennes weather SpaItalia attracted one of the finest displays of Maserati’s seen in Europe recently as Trident owners' congregated at the Grand Prix circuit. This year is also the 50th anniversary of Juan Manuel Fangio’s fifth title in the Formula 1 drivers' championship, and on that occasion he was famously driving a Grand Prix Maserati. Now in its 6th year, SpaItalia has evolved into a must-attend convergence of exception, taste, and affluence. Founded in 2002, SpaItalia is a celebration of Italian style centred on hundreds of Italian exotic automobiles, with annual showcases of one or more legendary Italian marques and designers. 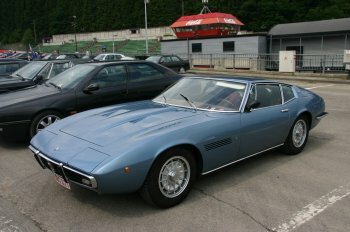 The 2007 SpaItalia was held on Saturday and Sunday, June 2 & 3 at the circuit of Spa Francorchamps – Belgium. 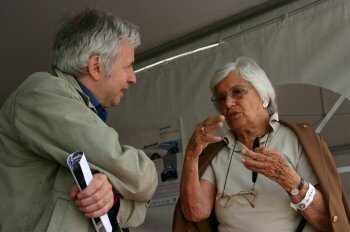 Maria Teresa de Filippis, the first woman in the automobile sport history to drive a Formula 1 car during a Grand Prix, was also present during the SpaItalia weekend. She competed in a Maserati 250F during the 1958 Belgian Grand Prix at Francorchamps, which represented her second Grand Prix of her career. During this race she finished in a highly respectable 10th position. An emblematic figure of the Maserati marque, Maria Teresa de Filippis is member of the Association of the Former GP Pilots and she is President of the Club Maserati International.